We have many potted wood sorrel plants and bring them in the house in the winter. Is it possible to just dig up and store the tubers over the winter instead of bringing the pots inside. We live in the chicago area and the potted plants do not tolerate them winters outside. 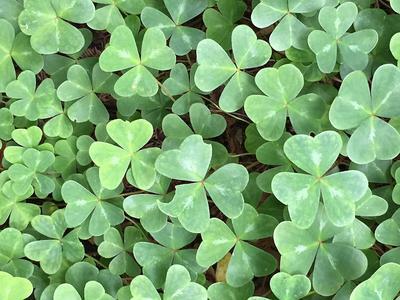 The wood sorrel I'm familiar with is actually Oxalis triangularis subsp. papilionaceae with purple leaves. There are several different types, some with extreme markings, others with plain leaves. They are grown as an annual in lots of areas with colder winters. To keep them overwinter, you can bring them inside to a cool bright window, or let them freeze off and leave them in a cool dark place such as an unheated garage. They need this treatment periodically, if not every year. It gives them a rest so they can come back better than ever. In your case, since you have several, why not try an experiment? Leave some in pots in the garage or basement and let them dry out (don't forget them in the spring!) and let some of the others freeze and then bring in the bulbs, store them in a bit of peat moss in a bag until the weather warms in the spring, then pot them up again. Keep a couple as houseplants in case your experiments fail. As these are bulbs, don't overwater them at any stage - make sure the pot has good drainage and use somewhat sandy soil. So no matter what you try, keep records to look back on, and remember which method gives you the best success. Good luck with your lucky shamrock!